Whitley Neill Quince Gin is a popular Gin available from Amazon.co.uk in 70cl to buy online. Visit Amazon.co.uk for the best price for 70cl of Whitley Neill Quince Gin or compare prices on our other Gin products. Blending Persian herbs with Turkish quince juice, Whitley Neill Quince Gin has prominent stone fruits (peaches and apricots) but is dominated by the unmistakable flavour of quince. Coriander and lemon zest make a notable appearance before ending with a long, fruity finish. Where to buy Whitley Neill Quince Gin ? Whitley Neill Quince Gin Supermarkets & Stockists. 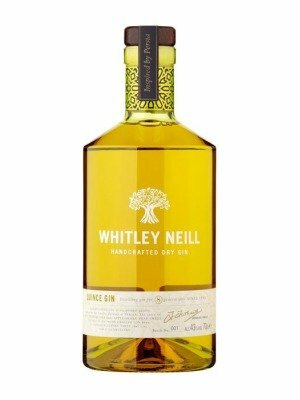 You can buy Whitley Neill Quince Gin online in most retailers and find it in the Gin aisle in supermarkets but we found the best deals online for Whitley Neill Quince Gin in Amazon.co.uk, TheDrinkShop, 31dover.com, DrinkSupermarket.com, and others. Compare the current price of Whitley Neill Quince Gin in 70cl size in the table of offers below. Simply click on the button to order Whitley Neill Quince Gin online now.